The reception desk. Image courtesy of Francis Cauffman. For law firm Ballard Spahr, responsiveness counts. 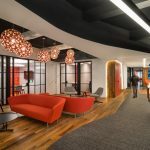 Their newly remodeled, eight floor, 200,000 square foot office space in Philadelphia is proof of that maxim. The open, collaborative floor plan touts efficiency and responsiveness to modern office needs, while casting aside the heavily wooded and brass-ed design of law firms past. Award-winning architecture firm Francis Cauffman completed the two year renovation in the BNY Mellon Center last May, and the result is adaptable and amenity-rich: there’s a central staircase as an alternative to elevators, natural light to keep you energized, and a fitness center that takes the idea of “workplace flexibility” most literally. Scroll for more from the design team at Francis Cauffman. The view from the elevator lobby. Image courtesy of Francis Cauffman. Image courtesy of Francis Cauffman. A meeting space. Image courtesy of Francis Cauffman. The building is above a concourse with access to mass transit both inside the building and within walking distance. View to conference rooms. Image courtesy of Francis Cauffman. What furniture brands/dealers were used? Haworth and TransAmerican were the furniture manufacturers in the practice areas and shared common areas. Muraflex and Premier were the manufacturers for the glass office fronts. Keilhauer and Stylex were the furniture manufacturers in the shared common areas. Bernhardt and HBF were the furniture manufacturers in the conference areas. Most of the Ballard Spahr employees work on-site. Ballard Spahr LLP wanted its largest office to match its growing, national reputation. Therefore, this project radically re-envisions the firm’s regional headquarters and transforms it into a collaborative workplace that is a prototype for its offices around the country. The design transformation reflects a more collaborative, quality-driven space than its previous office. The office is a more interactive, quality-driven environment than its previous space. The team at Francis Cauffman redesigned the firm’s existing space as a light-soaked, view-filled, and amenity-rich workplace that is flexible and collaborative. While the distance of the support staff is farther from the attorneys than it was before, the support staff work in teams in the new space, so it creates shared neighborhoods and a sense of cohesiveness. Francis Cauffman used extensive communication and collaboration to create a space that meets the design goals for Ballard Spahr’s new workplace; therefore, there was little difficulty for staff moving into the new space. Conference room. Image courtesy of Francis Cauffman. Ballard Spahr’s new design encourages employees to move around and offers more opportunities for direct interaction. The office is 20 percent smaller than it was before and therefore more efficient, as the firm consolidated its operations from 10 floors to eight floors. Francis Cauffman’s design increases the elasticity of the office, so it feels bigger and more open, despite the reduction in real estate. The designers set out to transform Ballard Spahr’s “I” space into more “we” space, an adjustment for even more typically progressive companies, and especially a law firm. Francis Cauffman set aside 65 percent more space in the renovated office for collaboration and teamwork. The amenity-rich workplace also creates a greater sense of community. Each floor has a central hub located near a collaborative space and conference room. Amenities include a full conference floor, open lounge spaces and cafés, a “grab and go” concession, a town center, a cafeteria, and a gym on the concourse level. The designers also created a layout that is easy to navigate. The thoughtful plan fosters intuitive navigation patterns designed to be environmentally friendly, while logically restructuring the numerous departments. Many of the design elements promote wellness. The central stair provides connectivity between all eight floors and encourages a healthy alternative to the elevators.